To Elsie Chin, HYID’s principal designer, good design isn’t just about creating functional spaces, it’s about creating experiences. And in the kitchen, these experiences are all the more significant. By bringing this humble space to the forefront of the home, Chin designs a kitchen concept for Aurastone that reinvents the ways in which the culinary space can be used. Chin’s indoor-outdoor kitchen design is a play on transparency and light, manipulating these elements to merge the interior and exterior spaces—the pavilion features sliding glass doors that erase the boundaries between the interior space and the outdoors. The glass doors offer unobstructed views of the surrounding greenery and pool area, with ample sunlight streaming into the kitchen. The pièce de résistance of the space: the massive, elongated kitchen island that connects the two areas. 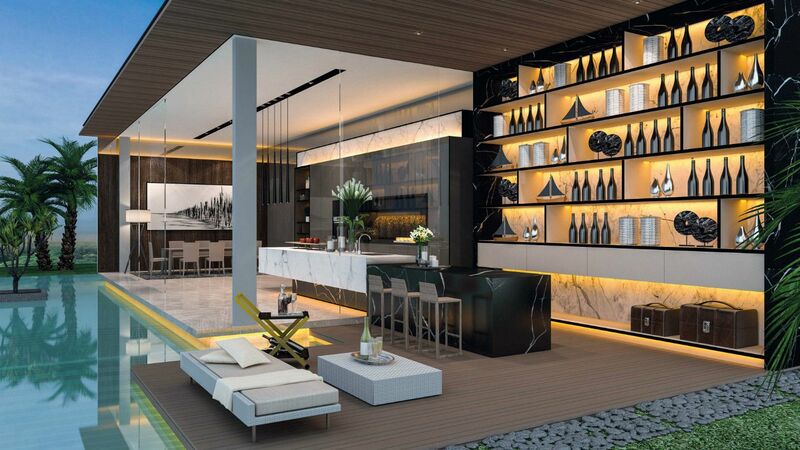 Wrapped in two contrasting quartz surfaces from Aurastone (the Calacatta Classico and Verace Marquina), the interlocking blocks combine an indoor kitchen counter with an outdoor entertainment bar. The resulting dining, cooking and entertainment areas thus co-exist, adjacent to one another to create the ultimate poolside kitchen. The same materials are also used to clad the interior walls, frames and ledges, creating a timeless and elegant monochrome look.